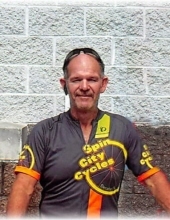 Timmy Earl Wallace, 56 of Tower Hill passed away Monday, February 4, 2019 at his home. He was born December 31, 1962 in Pana, IL to Norman & Norma (Merrifield) Wallace. Tim married Sherry Jo Page on June 9, 1984 and she survives his passing. Tim had lived most his life in Tower Hill and spent a few years in Las Vegas with his family. He graduated from Tower Hill High School. He was most recently a welder at GSI in Assumption but spent most of his life as a millwright and fabricator. He was an amateur nutritionist and racer. Tim enjoyed RC cars, cycling, racing, skating, fixing anything and everything his family needed and loved working on anything that had a motor. His greatest love was his family. Along with his parents and wife, Tim is survived by his children Paige (Travis Woods) Wallace of Waxahachie, TX, Sara Jo (Nathan) Mosely of Tower Hill, IL and Elizabeth Wallace of Pana, IL, grandchildren Olivia Ann and Lillian Joleen Strohl, siblings: Takina (John) Barnes, Kaufman, TX, Twila Ginger, Pekin, IL, Tony (Brenda) Wallace and Teresea Wallace both of Tower Hill and numerous nieces and nephews. He was preceded by his brother Victor “Tiger” Wallace. Funeral services for Tim will be held at 10:00 AM, Friday, February 8, 2019 in McCracken-Dean Funeral Home with Derrick Richie officiating. Burial will follow in Tower Hill Cemetery. Visitation will be held from 5-8 PM on Thursday, February 7, 2019 at McCracken-Dean Funeral Home. Tim’s family requests that everyone “come as they are” or in Tim’s favorite attire, blue jeans and a yellow shirt. Memorials in Tim’s honor may be made to the choice of the donor and will be accepted by McCracken-Dean Funeral Home who is assisting the family. "Email Address" would like to share the life celebration of Timmy Earl Wallace. Click on the "link" to go to share a favorite memory or leave a condolence message for the family.